LONDON – Before dawn’s early light on Sept. 5, 1972, a group of Palestinian terrorists dressed themselves in track suits, stuffed their duffel bags with machine guns and hand grenades and climbed over a fence at the Olympic village in Munich. Black September they called themselves. In that, they delivered. They overtook two apartments holding Israeli athletes and coaches, killing two on the spot. They massacred nine more that night at a nearby airport. A German cop was also killed before five terrorists were shot dead. “The longest and most terrible day in the history of the Olympic games,” ABC’s Jim McKay told the world that day. It’s been 40 years since that act of brutality shattered whatever hope the Olympics held for peaceful competition outside the world’s geopolitical battles. It’s been 40 years since one of the best ideas of the Olympics – its diverse athlete village – was stained with blood. It’s been 40 years, and, still, this isn't an old concern – the fears of terrorism remain as the London Games are set to begin this weekend. Yet there will be no mention of that Munich event at Friday’s Opening Ceremony. There will be no moment of silence. No official honoring. No recollection of what happened. “We feel that the opening ceremony is an atmosphere that is not fit to remember such a tragic incident,” said Jacques Rogge, the International Olympic Committee president. Of course it’s not fit for Rogge, the Olympic titan who lives in a fantasyland of banquets and parties and uses the idea of athletes competing for free to live a most lavish lifestyle. It's all fun. It's all games. It's all money for him. There’s never time for sober reminders of real-world tragedies, even for just a few moments, when Rogge would prefer we concentrate on the hosting of another billion-dollar party. Instead, we’ll get the usual spectacle – a British countryside on the floor of the stadium, Paul McCartney playing live, flags, dancers and the parade of athletes. Maybe even Muhammad Ali. Perhaps Rogge just doesn’t want to dampen the mood. Perhaps, as the Israelis contend, he’s too scared of offending Arab countries. Maybe he’s just an aristocrat who takes himself and his role in the world far too seriously. None of it makes it right. And that’s the point. The Olympics aren’t the place to address every one of the world’s many wrongdoings, tragedies or disputes. No one is suggesting a mention of the 10th anniversary of the Sept. 11 attacks in America. This tragedy happened at the Olympics. It happened because of the Olympics. It happened because of the publicity the Olympics provided. It happened right in the Olympic village, that amazing concept where athletes across the world live together, breaking down all boundaries and walls. It’s a place where two boxers can try to slug each other by day, and hang out at night. Where rich and poor countries live side by side. Where lifelong friendships and understandings are supposed to be created. Black September tried to murder that ideal, along with the Israelis. To ignore that is to live in a bubble of ignorance where the music can’t stop, even for a moment. Honoring those victims doesn’t send a political message any more than not honoring them sends a political message. Rogge instead took a moment of silence in a low-profile event earlier this week, promising acknowledgement later in the year. Those are small attempts. The Opening Ceremony is an opportunity to use the Olympics’ big stage, to draw the eyes of the world. It is the perfect atmosphere for a few moments of remembrance. One of the great impacts of the Olympics is its ability to teach people across the globe about far-off countries and cultures. It offers a reminder that smaller countries exist. It’s a time for parents to pull out maps and show their children the world expands far beyond their neighborhood or nation. It’s a time where the grace or genius of a single athlete can overcome political rivalries and show the good of a different people. NBC’s Bob Costas has promised to have his own minute of silence on the American broadcast Friday, a slap in the face of Rogge. "I intend to note that the IOC denied the request," Costas told the Hollywood Reporter. "Many people find that denial more than puzzling but insensitive." Leave it to a broadcaster to seize the chance to do the right thing, to send a simple and powerful message about the past and the future. 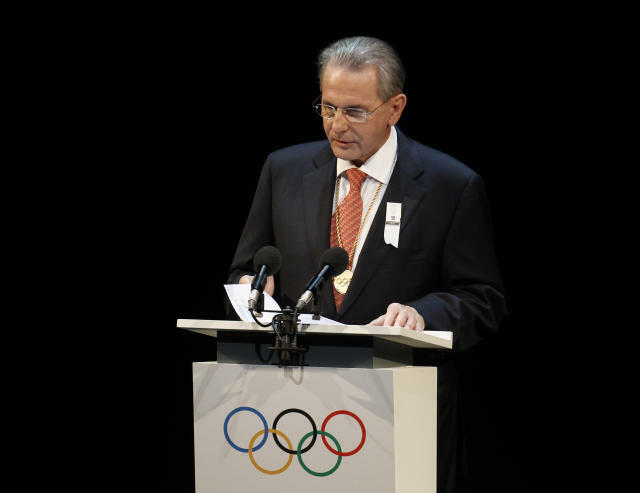 Jacques Rogge has no such time, no such perspective, no such courage. His party just goes on and on. Keep McCartney playing. There’s champagne to drink and money to count and history to forget.